Let's go make some fantastic tahini sauce! Mix the corn starch and 1/4 cup milk to full y dissolve the starch. Put the cheese in the sauce pan and add enough milk to just, barely cover the cheese. Add the balance of ingredients and set the stove to medium-low heat (between 2 and 3 on a "1 to 9" dial on your stove). Stir the sauce constantly while heating. 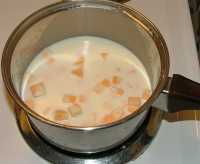 You will see the cheese turn to a big lump in the milk but keep stirring - it will break down and become sauce. If the sauce is a too thick - thin it with a little milk. Add very little at a time since thinning goes MUCH quicker than thickening. You can flavour your sauce with (very) little garlic or some chopped chives or any herb (or other flavouring you favour). What ever you add, don't forget... Put it into the pot right at the start of the cooking cycle! We usually base the sauce on cheddar blended with gouda and/or some swiss for flavour effects. Too much swiss will make the sauce very grainy as will any older cheese. We don't use salt in this recipe since the cheese is normally salty enough. There are many Cheese Sauce Recipes around. This one is simple! This recipe makes enough for about 4 serving - depending upon how much sauce you like on your food. Made too much? Don't worry ... cheese sauces refrigerate wonderfully and, when stored at appropriately cool temperatures can be used several days later. It may, however, require a little thinning.